Rosalind is my mummy. She is a dedicated mummy who became a homemaker to care for us. So in the midst of the haze, she continued her marketing and bought some really fresh snakehead collars and fillet one day. And boy did she do justice to the fish by searing it to perfection and made a very yummy fish bee hoon soup for the family to cheer us up. It was the most satisfying dish during the entire week! Here's her recipe and I hope it will bring joy to your family like it did for mine! 1. Marinate group A ingredients for at least 2 hours. 2. Heat wok with a few tablespoon of oil. 3. Place fish skin down and sear it till golden brown. 4. Add Ikan bilis stock and carnation milk and bring to boil. 5. Taste and add salt or water if necessary and simmer till fish is cooked. 6. 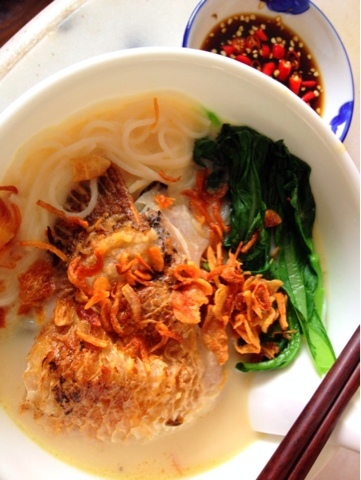 Arrange cooked bee hoon and place fish, vegetables and fried shallots on top and pour the hot soup. *Add XO before serving if you desire. 7. Enjoy while it's hot!